Deep work of kabbalah by the kabbalist Rabbi Moshe ben Yaakov of Russia. Printed by Johann Anton Krieger. | Rabbi Moshe ben Yaakov was a great sage of his generation. He went to study Torah in Constantinople because Lithuania wasn’t a center of Torah study at the time. In 1495, he began to write this book. The same year Jews were expelled from Lithuania, and he was captured and brought to Karim-Sulkhat, and redeemed by the rabbinical and Karaite Jews. The Jews of Crimea put his piyyutim into their prayers, and over the generations he became known as one of their great rabbis. Known by them as Moshe Ashkenazi or Moshe of Russia. 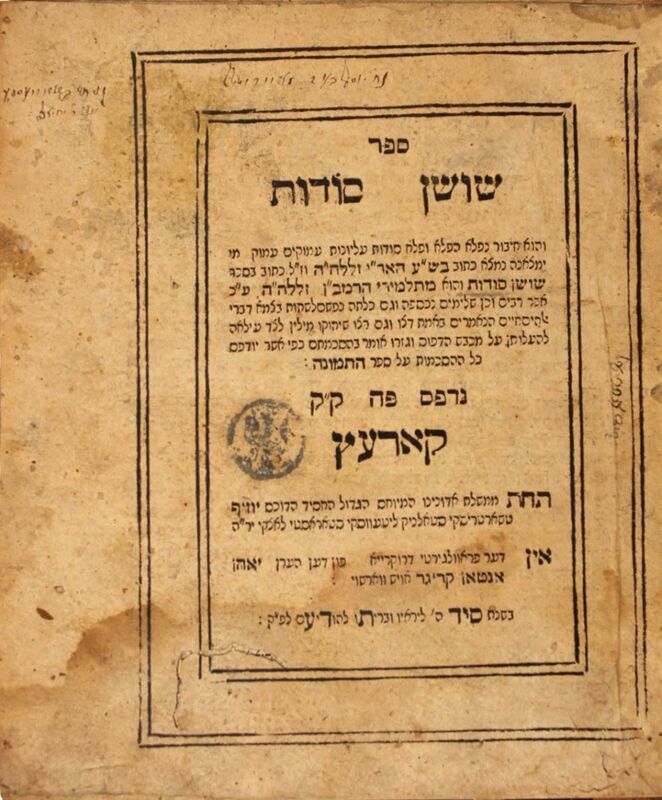 Mentioned in the Shulchan Aruch HaAri as a student of the Ramban and author of the Shushan Sodot. | Signature of ownership, moth holes, stains, front binding and spine missing. | 92,  pages. 20cm. Margins are repaired with some missing text, new binding, generally ok to good condition.